Here is the video for the final peak in my Hyakumeizan quest. The hardest part about hiking in Japan is getting to the trailheads, as I’ve reluctantly had to accept the harsh “all buses leave from Tokyo” mentality that various bus companies have adopted over the last several years. 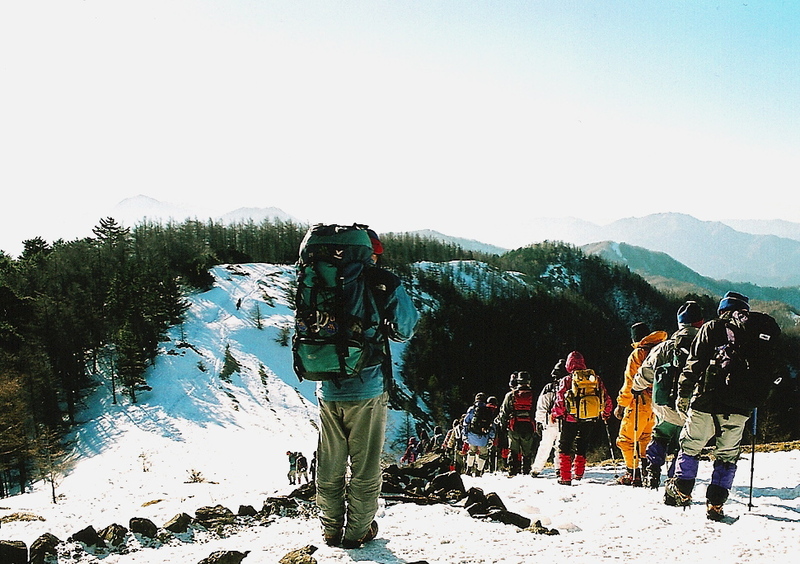 Alpico Group is the biggest culprit, drastically slashing their money-losing night bus services from the Kinki region to the Japan Alps, forcing Kansai-based hikers to travel all the way to Tokyo just so they can get to the mountains at a decent time! My dreams of catching an Osaka-Chichibu overnight bus were indeed just a dream, as I settled on a cramped, crowded one to Ikebukuro, which allowed me to catch the first train to Chichibu. My mission this time? 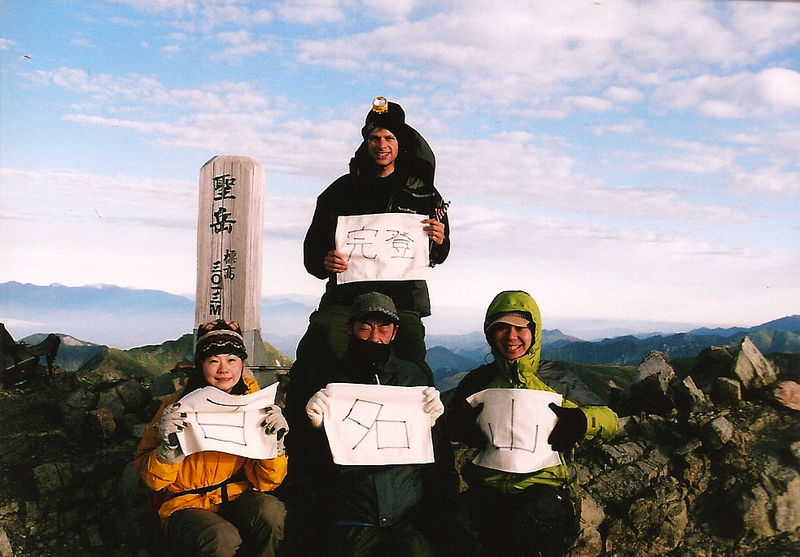 Complete the Mitsumine-Kumotori traverse on a beautiful national holiday weekend in March. I made all of the necessary transfers, and got off the bus at the base of the now-defunct Mitsumine gondola shortly before 9am. While most of other other bus passengers were queuing for the easy ride to the top, I opted for the long, winding trail. I try not to waste my money on such technological conveniences (unless I’m snowboarding that is). The trail was quite scenic, passing a few waterfalls on its steep climb to the summit. It took me about 90 minutes to reach the shrine, which, along with Mt. 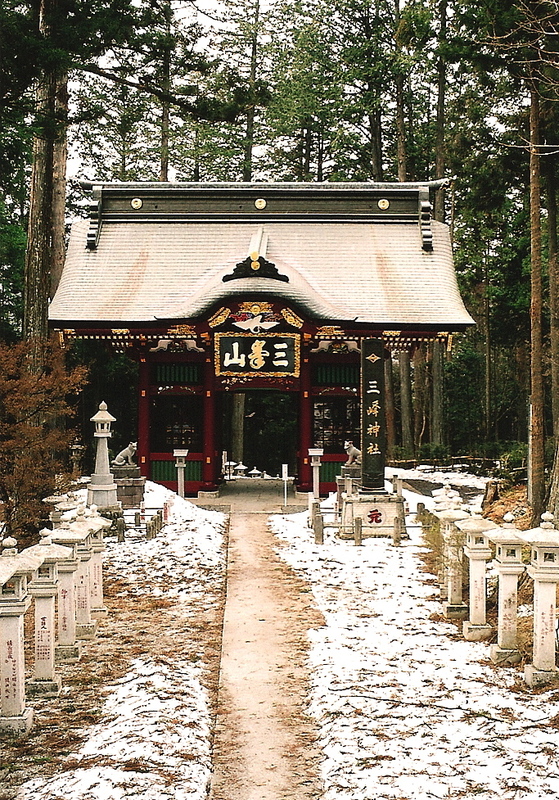 Haguro in Yamagata Pref., is one of the most beautiful mountain shrines in Japan. I took a quick break, filling up my water bottles at the shrine, and started on the long ridge walk over to Kumotori. Being late winter, there was a nice 40cm snow base throughout the cedar forest. The snow depth gradually increased until reaching the bald summit of Kirimo-ga-mine. It was there that I spied my first view of Mt. Asama, still smoldering from the eruption a mere 6 months ago. From this angle it reminded me a bit of the volcanoes in the Cascade Mountains of Oregon and Washington state. 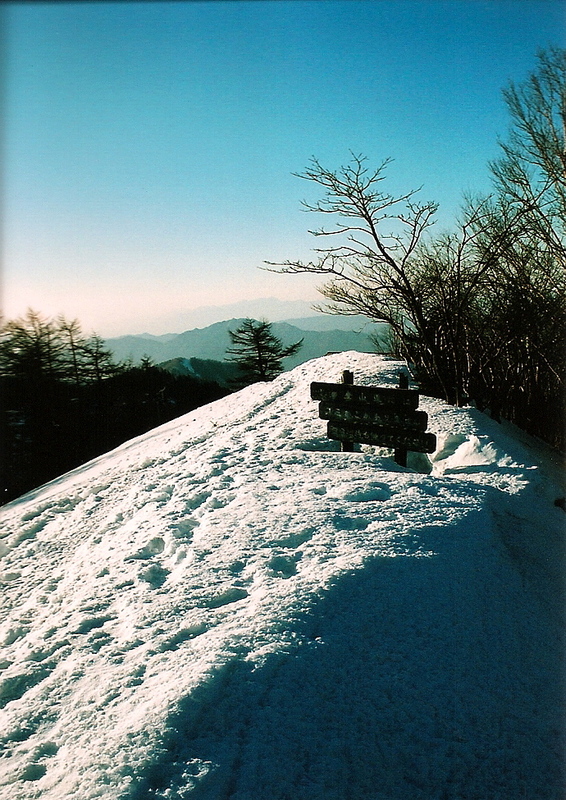 I continued traversing along the ridge, enjoying the pleasant snow scenery and wonderful views. 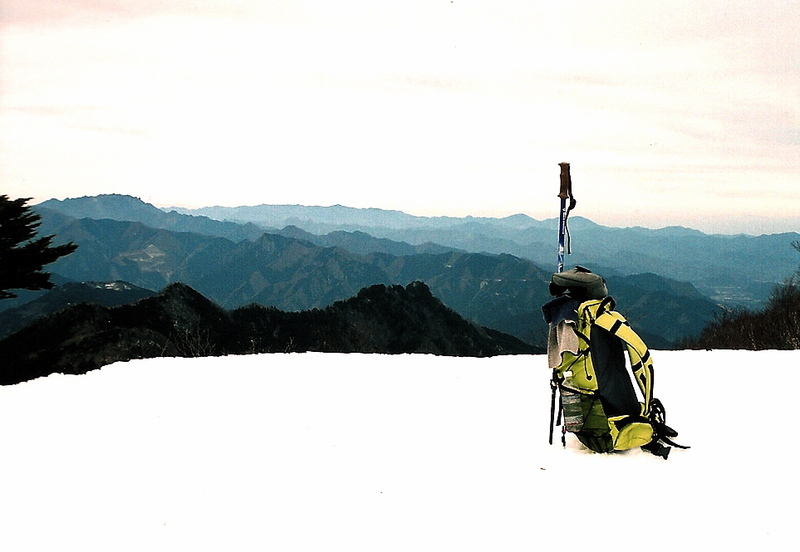 Even though there was close to a meter of snow on the ground, I never once used my crampons on the climb (the snow was soft enough without them). I made my way up and over Mt. 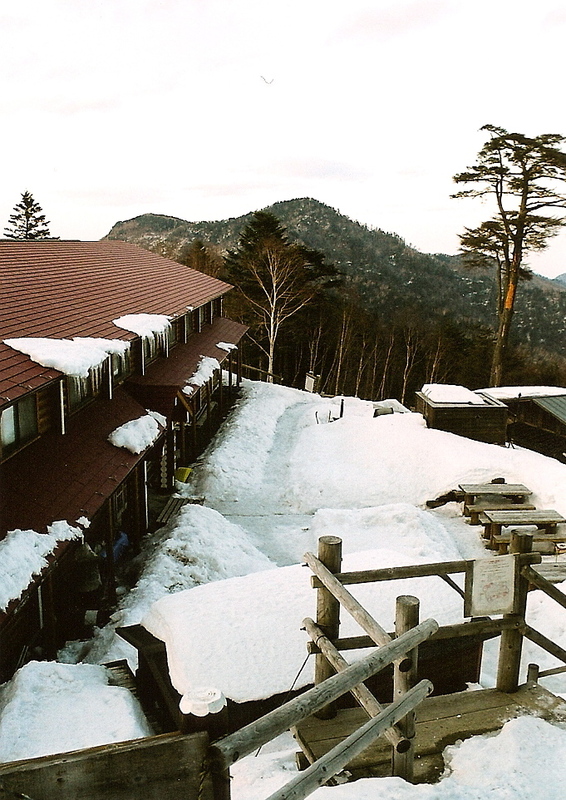 Mae-shiraiwa, arriving at a hut that was closed for the winter. Running short of water, I broke out the camping stove and water filter, melting a few liters worth of fresh snow. Ah, life on the mountains in winter – you never have to worry about running out of water! Another hour or so later, I arrived at an abandoned, run-down hut. “Wow”, I thought, “I expected Kumotori-sansou to be in a bit better shape than this”. My intuition told me that this somehow wasn’t the right place, so I continued climbing. Sure enough, around 10 minutes later I show up at the massive hut and checked in. It turns out the ruins I’d found earlier were indeed the remains of the original hut. In order to save a little money, I’d brought my own food and cooked up a feast alongside a few other brave hikers. We’d been quarantined to a small, dark and COLD part of the hut to cook our meals, while almost everyone else opted for the warm luxury of the dining hall (and overpriced meals). Luckily, each room had its own kotatsu table, and after dinnner I quickly claimed a spot directly under the radiating heat. My nose ran continually the entire night, thanks in part to the timely release of cedar pollen from the surrounding forests – damn this hay fever! The next morning the sunrise was stunning! I filled my belly with oatmeal, quickly packed up my things, and headed to the summit. Mt. 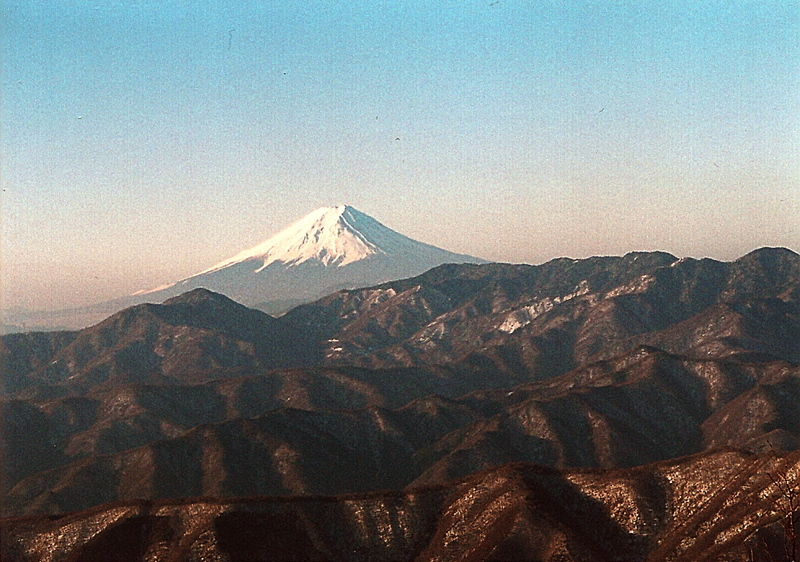 Fuji was rising brilliantly out to the northeast, and was free from clouds the entire day. On the northern part of the summit, I came across a wonderfully kept emergency hut, where 5 brave souls had bedded down for the night. I couldn’t even imagine how cold it must’ve been, but at least they’d saved some money. Down I went to a saddle, where another mountain hut awaited me. Crowds! Tour groups! More descending – ice! Time to put on the crampons. Up and over Mt. Nanatsuishi and down to another hut. Decisions had to be made. Stay on the ridgeline? or take the easy bypass trail? I opted for the exercise and up to Taka-no-su I went. Up and down, up and down. I even tried my hand at glissading in some very slushy snow: I don’t recommend it. The final climb up to Mutsuishi seemed to take forever, but after that it was (literally) all downhill. The snowdissipated until I was hiking in fallen leaves. “Yikes”, I exclaimed! “Fallen leaves with a layer of black ice underneath”. 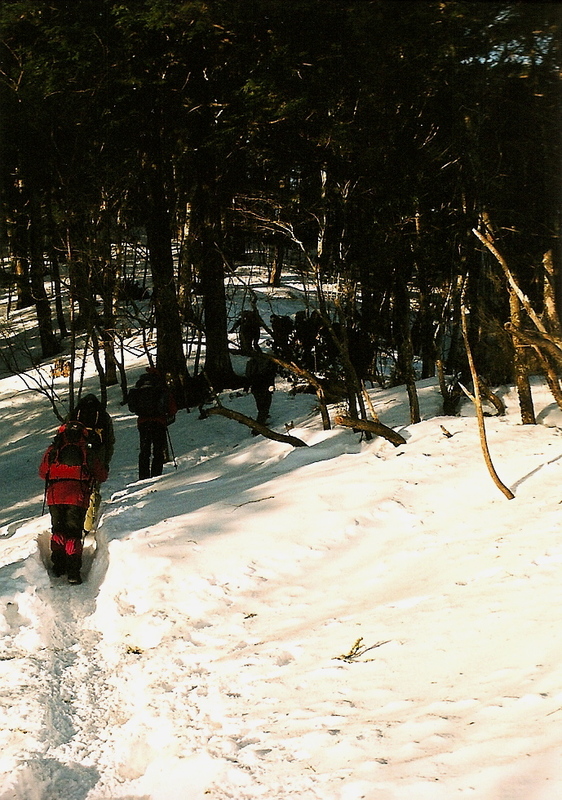 This was truly some treacherous hiking, for the leaves completely concealed the patches of frozen water. Back to civilization and cedar farms I went. Upon arriving in town, I glanced back to the mountains behind me. I saw a small patch of smoke emanating from where I’d just come from. Was someone burning rubbish? All of a sudden, the smoke intensified and huge red flames licked the surrounding greenery. We had a bona-fide forest fire on our hands. Not knowing exactly what to do, I pointed out the towering inferno to every passerby I encountered. The tactic seemed to work, as helicopter crews arrived within minutes to extinguish the flames. I’d really hoped there were no other hikers coming off the mountain, because it looked like it was in the exact vicinity of the hiking trail. With firefighters on their way, I retreated to the hot spring for a well deserved soak. By the time I’d come out, there was no sign of the fire, so it appeared to have been quite localized and minimal in damage. Perhaps cedar farms don’t burn as well as virgin forests? Kanako, Fumito, Yuuki and I had an absolutely fabulous time in stunning weather. We’ve captured the madness on video and will be uploading it soon. Thanks to everyone for your support and encouragement.